The Microlab 600's Dual Syringe Diluter configuration uses two syringes to create up to a 1:50,000 dilution in a single step, drastically reducing preparation time and wasted buffer. The diluent washes the tubing between each sample, minimizing carryover. In combination with the DURATEC liquid handling system the Microlab 600 ( bzw. 500) could be used for automated dilution of up to 120 samples. 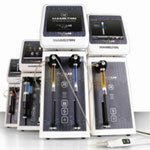 Different volumina and dilutions are possible within a single run without any manual work. Each dispenser is based on a positive displacement system that provides better than 99% accuracy, independent of a liquid’s viscosity, vapor pressure, and temperature. The volume range is 100nl up to 50ml.